XRP, the second-largest coin on the CoinMarketCap list, has fallen by over 2% in the past day and is seen falling further. At the time of press, the coin was valued at $0.3087, with a market cap of $12.7 billion. The coin reported a 24-hour trading volume of $835 million with a leap of 2.64% over the past day. The coin has recorded a fall of 2.64% over the past day and it continues to fall by 0.07% over the past hour. 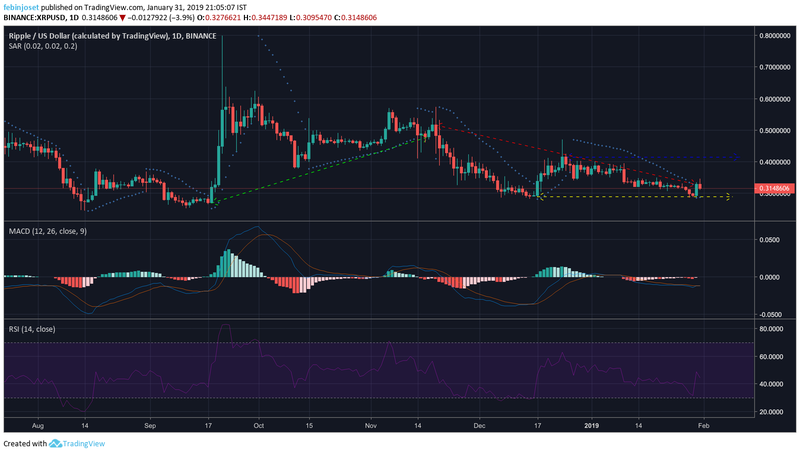 XRP reported a massive downtrend in the one-hour chart, which started from $0.3208 to $0.2909, with a minimal uptrend marked from $0.3124 to $0.2952. The coin marked a resistance at $0.3392 and a support at $0.3112. Bollinger Bands shows that the market volatility is high as the bands have diverged. The moving average line is over the candlesticks pointing toward the bear’s reign. Chaikin Money Flow also points toward the bearish market as the marker is under zero. The one-day chart of the coin noted a significant uptrend from $0.2684 to $0.4785. The coin plunged after that and a downtrend was marked from $0.5158 to $0.3276, with a resistance marked at $0.4141. The coin noted a strong support at $0.2887. MACD line is under the signal line after undergoing a recent crossover changing the market into a bearish one. The bear attack is strong this time as all the indicators predict a bearish trend. The coin has been suffering from January 27 and is still trying to fight the vermilion market.